I have experienced a pretty positive response through my transition so far. I have made it a point to surround myself with a close knit group of supportive people that I am incredibly thankful for, but reading some of the social media comments concerning bathroom use for transgender individuals was a bit of a reality check. Seeing words such as “Gross”, “creepy”, “disgusting”, “sick”, “freaks” and etc. ( the list goes on…) is really discouraging. These are words that have caused me much personal anguish, and a big reason of why it took me so long to consider transitioning. Most trans people have probably fought an inner battle with these words. They create wounds so deep it is hard to just bandage up and move on. It takes time to heal and it is like re-opening a wound to hear/see it coming from other people. 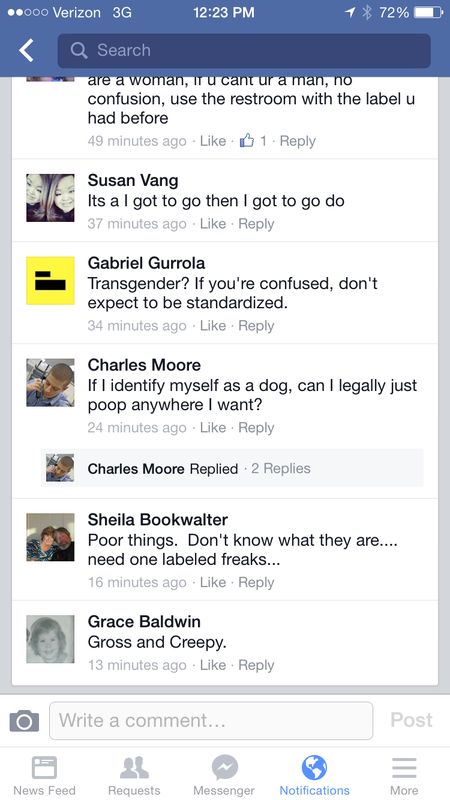 I can only assume that people may use these words toward transgender people out of fear or lack of education. 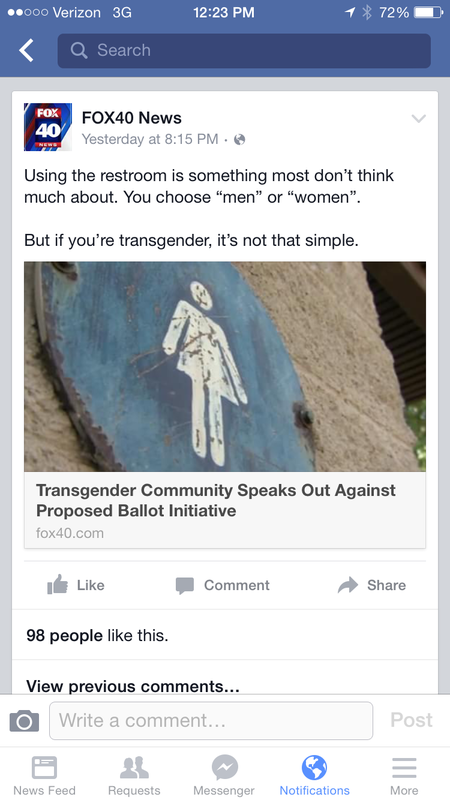 They most likely don’t personally know a transgender person.. not that they know of at least. It is a good reminder of why I am choosing to be more open about my own transition. I refuse to be ashamed, my world is not so freaky, and there is nothing creepy, sick, or disgusting about being transgender. I’m a pretty normal guy… ( depending on which friend you ask ). I go to work in the morning, I come home, workout, eat, and sleep. ( Maybe even poop?! ) The only difference is that I was born with a few abnormalities. 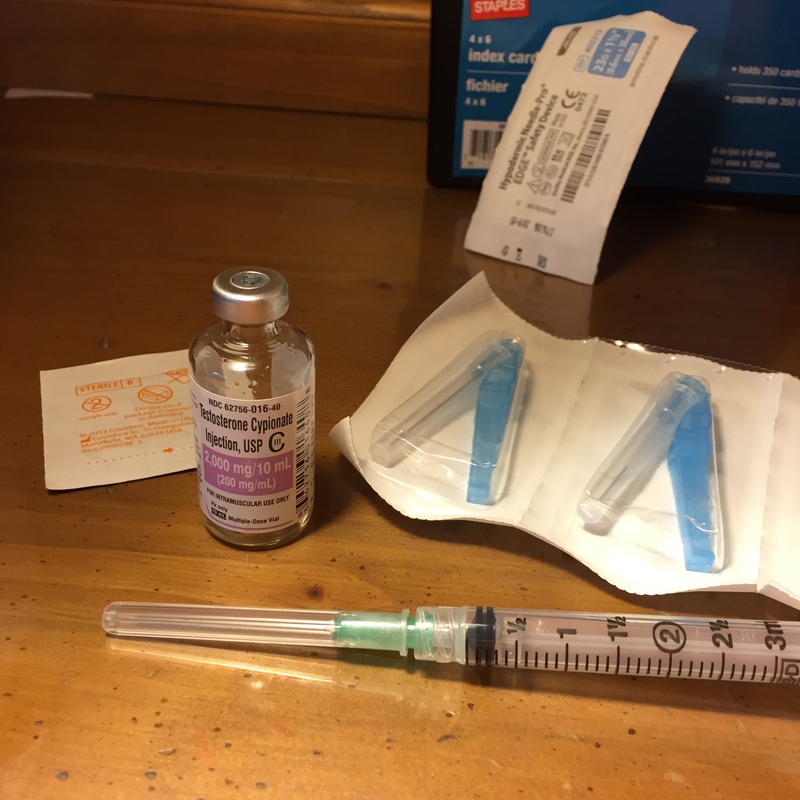 I may have a few more surgeries in my life, and my body doesn’t naturally produce enough testosterone on its own so I have to give my self an injection once a week. 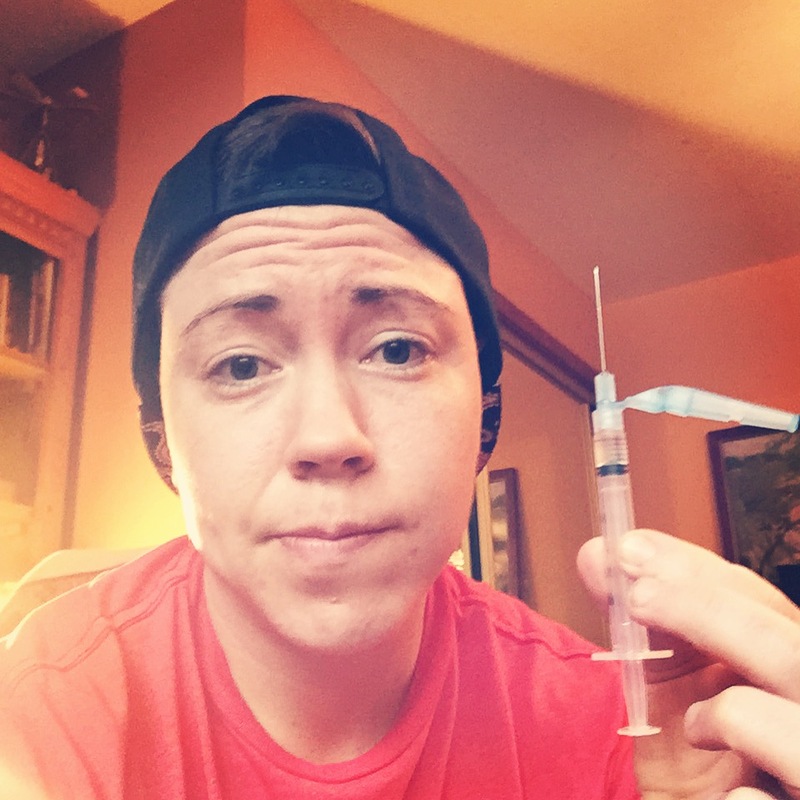 Being trans has taught me how to overcome many fears… a fear of needles being one of them. Every Saturday I go against all human instinct and self inject myself with a 1 and 1/2 inch long needle into my thigh. Some would say I did my transition a little bit backwards. Many guys go on hormones before they have top surgery, but I was on the fence on whether or not I would go on hormones at all. I was scared of many things about taking hormones and I wasn’t fond of the idea of having to rely on a medication for the rest of my life, but who is to say I wouldn’t have to rely on some sort of medication down the road…whether it is testosterone or something else…so I took the leap. 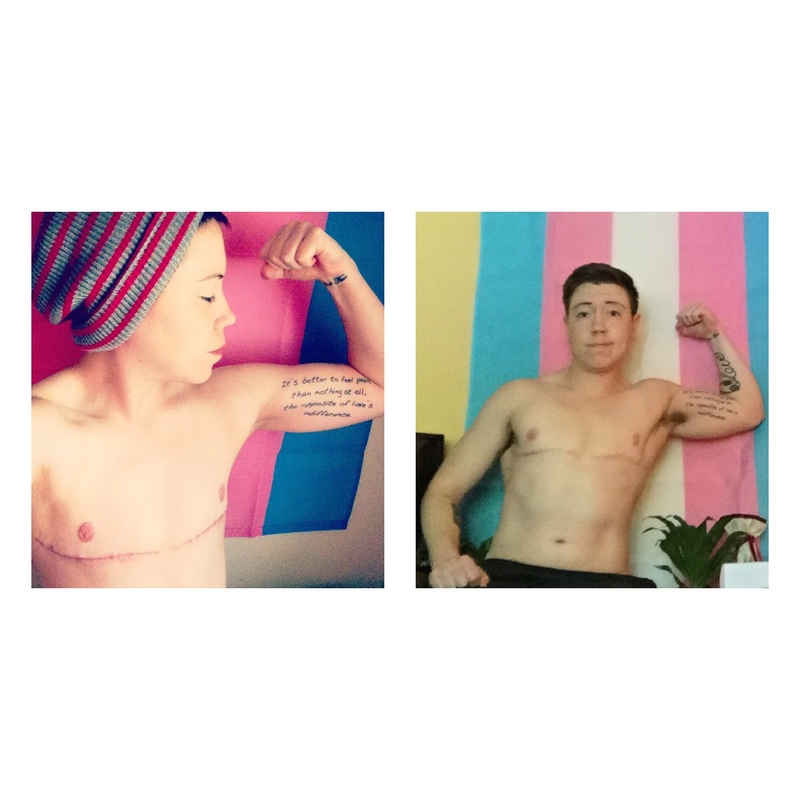 Top surgery day was one of the happiest days of my life. Before top surgery I wore something called a binder. It is an incredibly uncomfortable article of clothing that binds your chest to give it a flat appearance. It constricts your breathing and can even be dangerous if not worn correctly. But it eases dysphoria temporarily until surgery is a possibility. It is hard to believe I used to workout in a binder. ( not recommended! ) Before wearing a binder I would be so dysphoric about my chest that some days I wouldn’t want to leave the house. Unfortunately most insurance plans don’t cover things like top surgery, and many guys can’t afford to have surgery and are stuck wearing binders. I wore binders for about 2 years but was fortunate to have a friend help make top surgery possible for me. Not a day goes by that I don’t think about how grateful I am for this friend, or how there were times where I wanted to give up. She helped save my life. I am currently going through my second puberty. Just like any other teenage boy I require more food and sleep or else I am a bad mood waiting to happen. There are also a few hot flashes here and there to add to the fun. I dream of the day I may have a beard, and I dread the day that I may lose all of my hair… but just like any other guy, these are things I can not control. Deciding to transition is a good lesson in letting go. Bathroom anxiety is a real thing. If I am out in public I either hold my urine or I know where I can find a gender neutral bathroom or a single stall bathroom. I find myself keeping my liquid consumption down when I am out and about. I have only used the mens restroom once so far. It is always a hard call on which one to use. I fear being beat up if I am discovered in the mens room, and I fear being yelled at if I go in the woman’s restroom. I am mis-gendered more now by people I know well, rather than strangers. Friends, and people at work have been great about the name change, but it seems that the pronouns are the hardest part. I think it is because when I am around people everyday they don’t notice as much change because my face is still familiar… but when I am in public places around people I don’t know, I am usually identified as male. I don’t hear my birth name nearly as often as I used to. It happens sometimes usually by someone in another department at work. I don’t take offense because I know they probably don’t know my situation, but it hurts more than giving myself an injection these days. I don’t take offense to people slipping up or taking some time to adjust to name and pronoun changes, I only take offense when a person refuses to use my name because of their own issues… it is just plain disrespectful. This is a basic overview of what life for a transguy is like. Hopefully it helps take some of the mystery out of what a gender transition consists of. I live a pretty normal life, there is no need to be called a freak, or be disgusted by the way I live it. Although I am happier than I have ever been, there are still struggles. I face the fear of rejection everyday, and although I am strong enough most days to let negative things go, there are some days where hurtful words or situations can bring me down. I am just another human being. I live, breathe, and hurt just the same.